Stakeholders are a critical part of any product. Identifying all the stakeholders and managing them efficiently plays a significant role in determining the success of a product. In the Software industry, a Product Manager works with a team of product designers and software developers, closely. The PM understands the vision and strategy of the product, implements both while working towards a roadmap and also balances the needs of end-users with that of the business and manages cross-functional teams to build a successful product. On the other hand, a stakeholder is a person that has an interest in a product/business and can either affect or be affected by the business. A stakeholder can be an investor, governments, employees, partners, suppliers, customers, board of directors, executive managers, etc. They are important, mainly, because they help you build a successful product. Stakeholder Management is the activity of interacting and addressing all stakeholders involved in product management. It is also the process of working with all different cross-functional teams to build a successful product. Alignment means that your goals as a product team are the same or beneficial to those of your stakeholders. Alignment by force – the stakeholder is aligned with your product goals because he has no other option. Alignment through value – the stakeholder sees value in your product and is aligned to benefit your team. Alignment through relationship – the stakeholder is like a friend to you and you have a great relationship and thus, can seek help anytime you want. Importance is a measure of a stakeholder’s inherent influence on a product team. A stakeholder’s perception of their importance is different from their actual importance to a product. It is important to recognize the inherent influence of a stakeholder on a particular product. Categorizing stakeholders based on their inherent importance and alignment with the goals of the product team will help you stay on the same page and work with them efficiently. The Danger stakeholder is someone who has a strong influence on the team but doesn’t align with the goals of the product team. You may need to align with the stakeholder especially if the stakeholder is funding your business. They can have a negative impact on your product success and so it is important to understand where they stand and manage them accordingly. The first step is to understand why they’re misaligned. Give them value quickly. Show your product success to them and give them recognition. This will keep them happy. Use information derived from something else other than your personal perspective to deal with the stakeholder. For example, if you’re having unproductive meetings with your stakeholder which is not letting you concentrate on your team, create a Help! Sheet and pin it on the wall. Your team members can tick this sheet when they need you and then, share this sheet with the stakeholder which conveys that your team needs you and you need to concentrate on them more. Sometimes stakeholders don’t know what’s going on, keep them informed and in the process, make sure your body language and verbiage are appropriate. The Cautious stakeholder is someone who doesn’t have a strong influence on the team and is in misalignment with the goals of the product team. These stakeholders may think they’re very important but they have no stake in the product. Do not disrespect them as they can be a big problem for the company. These stakeholders don’t care too much about the success of the product but they hang on, because it makes them look good. If needed do not hesitate to have a difficult conversation. It is important to alert your manager or the top-management team in tough situations. The Advocate stakeholder is someone who has a strong influence on the product team and is in alignment with the goals of the product team. These stakeholders will help you achieve your product goals. They’re supportive either by force, through value or through relationship. Use a Double-Down approach – if the stakeholder is aligned by force, give them more value and enhance your relationship with them. Diversify your alignment – become friends with the Executive, tell your boss about the stakeholder so that they feel appreciated. 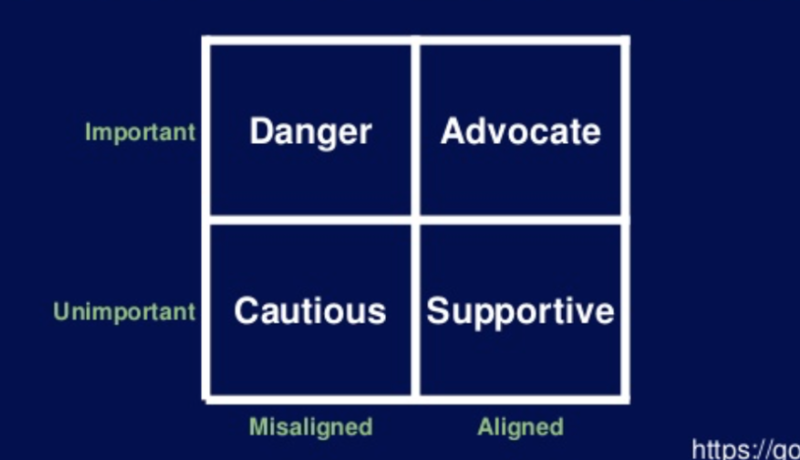 When the alignment is by force, there involves a high risk because the Advocate is important. In such situations, develop a personal relationship with them. Maintain advocates for a long period and give them opportunities where they’re made to look good. 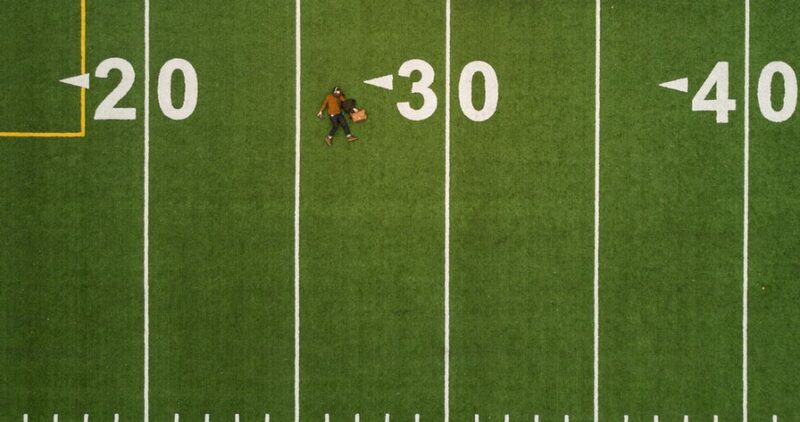 The Supportive stakeholder is someone who doesn’t have a strong influence on the product team but is in alignment with the goals of the product team. These stakeholders are like cheerleaders who like what you’re doing but aren’t relevant to the team. Make them look good, help them. Include them in a press release and give them a huge shout-out. These stakeholders usually recognize that they’re not too important and stay away from the team without being too involved. Nevertheless, make them look good and keep them around. This article is based on Dan Weiss‘s talk “Strategies to Manage Stakeholders”. You can watch the complete product talk on Youtube. Would you recommend a different strategy to manage Stakeholders? Let us know!